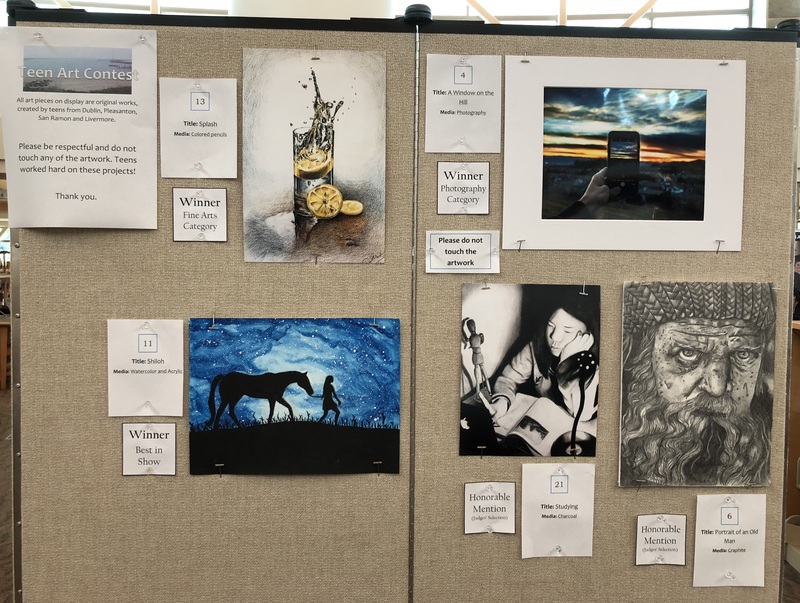 Congratulations to our winners in the Teen Art Contest! Best in Show was awarded to Courtney for her piece, Shiloh (the blue painting with the silhouettes). Winner of the Fine Art category was awarded to Susanna for her piece, Splash, (a colored pencil piece depicting water splashing out of a glass). Winner of the Photography category was awarded to Ekansh for his piece, A Window on the Hill (the photo within a photo). Honorable Mentions were awarded to Aarthi for Portrait of an Old Man, and to June, for Studying. Thank you to all of our teen artists who participated. The artwork was lovely, and was a wonderful display at the library. (Cash prizes were provided by the Friends of the Dublin Library.